Post Traumatic Stress Disorder (PTSD) is becoming the most prevalent anxiety disorder due to the abundance of currently occurring natural and human-caused disasters. 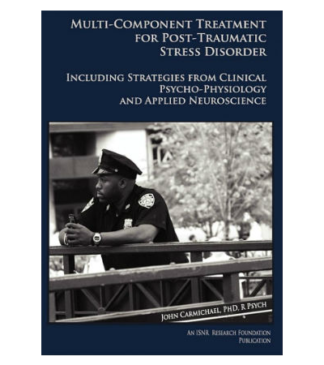 In Multi-Component Treatment For Post-Traumatic Stress Disorder, Including Strategies From Clinical Psycho-Physiology And Applied Science, healthcare providers, such as psychologists, physicians, counselors, and biofeedback and neurofeedback therapists, will find comprehensive assessment and treatment plans for clients and patients suffering from this often disabling disorder, as devised by Dr. John Carmichael. The plan can be used in its entirety or parts can be gleaned as relevant to the practitioner’s scope of practice. Dr. Carmichael integrates existing clinical and empirical research with his extensive clinical experience into a step-wise format for the treatment of PTSD including neurofeedback, biofeedback, nutrition, stress management, education, and behavioral applications. This book guides the practitioner who works with law enforcement and military personnel, as well as clients with personal trauma, through an evidence-informed multi-component treatment plan. About the author: Dr. Carmichael holds membership in a number of professional groups including both the Canadian and American Psychological Association, the International Society for Traumatic Stress Studies, the Association of Applied Psychophysiology and Biofeedback, and the International Society for Neurofeedback and Research. Since 1985, a gradually increasing percentage of Dr. Carmichael’s clinical time has been devoted to the assessment and treatment of PTSD , serving veterans of both police services and military units. This time now exceeds 90%. Dr. Carmichael lives with his wife Lynne in British Columbia, Canada.